#147 - The murder mystery show! 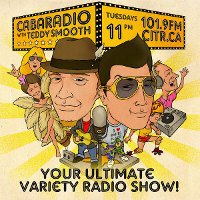 Tonight on CabaRadio with Teddy Smooth it's our 'Murder Mystery Show!" with special guest host Filthy Richard! Join us as we welcome Melanie Talkington for a talk about corsets for her upcoming show Parisian Antique Corset Exhibition and Soiree! Plus members of MURDER AT THE GRAND GATSBY SPEAKEASY stop by with their fedoras, feathers, zoot suits and garters! Don't forget about the PRIZES!! Win tickets to Jason Rouse - The Jester from Hell! & Jackie Brown...oh and upcoming event and sweet tunes!